Right after their re-elections, President Obama and George W. Bush both suffered through the first year of their second terms. 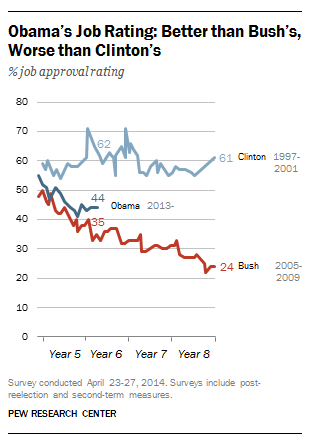 Heading into this year’s midterm elections, Obama’s job approval rate may be nothing to brag about, but it is better than Bush’s was at this point in 2006 and Obama appears to be less of a drag on his party’s midterm prospects than Bush was. Obama’s job approval rating stands at 44% while Bush’s was 35% at the same point in the 2006 midterm year, according to a Pew Research Center survey conducted April 23-27. But Obama can look with some envy at where his Democratic predecessor — Bill Clinton — stood in his sixth year. Clinton’s approval rating was a solid 62%. Helped by a strong economy, Clinton finished out his presidency at about the same high level of approval, while Bush sunk even further, ending his term as the 2008 financial crisis was underway. Obama, at this point, is hovering somewhere in between them with his future trajectory yet to be determined. Another measure of what impact the standings of Obama and Bush might have on the midterms is the extent to which voters say their decisions are meant to be a vote for or against the sitting president. At this point in 2006, 34% of voters regarded their midterm vote as opposition to Bush while 17% said it was a sign of support. This year, 26% of voters see their vote as one against Obama while 16% say their vote is meant to support him.